CHAD PLAUCHE-ADKINS The Marietta Times Michael "Moon" Mullen practices a few original songs Wednesday at Over the Moon Pub and Pizza. 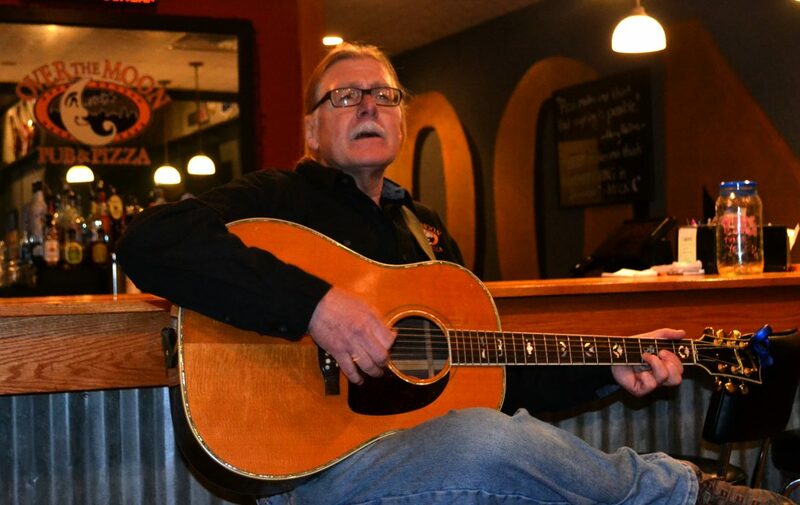 According to Michael “Moon” Mullen, owner of Over the Moon Pub and Pizza on Front Street and local musician, folk music uses lyrics to drive the song by telling a story. This Friday, at 8 p.m., three local musicians will tell their stories in the tradition of Bob Dylan and Willie Nelson at Over the Moon Pub and Pizza. Mullen is one of the performers scheduled to appear on Friday and he said the event will be in an non-traditional format. “We will be performing in the round,” he said. Mullen said that he, along with John Kunze and Levi Westfall, will take turns playing songs and telling stories about them. “The first time I saw singer/songwriters in the round was at the Blue Bird in Nashville 40 years ago,” he said. Mullen said the Blue Bird is known as a hub for singer/songwriters to share and refine their craft. He said he wanted to bring that feeling to Marietta. “Each of us has our own style,” he said. Mullen said Westfall is very good at playing serious love songs, Kunze has a country flair and he has more of a bluegrass background. Kunze described himself slightly differently. “I’m a mix of outlaw and modern country,” he said. The 39-year-old Kunze said he has been playing guitar for about 15 years, but has only recently started sharing his talents with others. “I didn’t even start playing in front of people around campfires until five years ago,” he said. The Belpre resident said his wife decided his skill had gotten to the level where he should showcase his talents. Despite his refusal to compete, his wife signed him up for the yearly talent search last held at the Adelphia Music Hall in September. The win opened up a chance for Kunze to record some of his original music with Red Ridge Entertainment in Nashville. During that time, his love for writing music flourished. Mullen said he and the other performers will be playing off each other’s songs as the night progresses. For more information visit Over the Moon’s website at moonpizza.net. •What: Songwriters in the Round. •Where: Over the Moon Pub and Pizza, 170 Front St.
•When: Friday beginning at 8 p.m.